Hundreds of trees are available from Casey Trees for community groups to plant in projects across the District next spring thanks to a generous donation from American Express®. The deadline for submitting applications for Casey Trees’ Community Tree Planting program is November 30. Neighborhood groups of all kinds, condominium associations, school and church groups are encouraged to apply. Casey Trees provides the trees, planting tools and technical support. The sponsoring groups bring volunteers and commit to care for the trees for at least two years. Applications are online at http://www.caseytrees.org/. Casey Trees and its Citizen Forester volunteers who help coordinate the projects have extensive experience working with groups new to tree planting. Photos from recent planting events are on the Casey Trees website. From September 22 through October 31, American Express® card holders and merchants teamed up to vote for trees for Washington DC as part of the eight city ROOT FOR TREES campaign that resulted in a $100,000 contribution to Casey Trees to plant trees in DC. 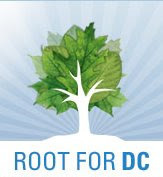 Visit http://www.rootfordc.com/ for more information. Casey Trees is a nonprofit organization working to restore, enhance and protect the tree canopy in the Nation’s Capital.